No selling fees on TrueGether! eBay is the pioneer of the concept of eCommerce marketplace to buy or sell across the globe. A pool of big sellers had already associated with eBay during a short span of time since its launch as there was no other alternative to eBay. This association with big sellers is the vital reason for the significant growth of eBay over the other marketplaces. Over 70% of the eBay sale is claimed to be driven by this pool of sellers. However, as per the recent marketplace survey over 10 marketplaces have emerged as alternatives to eBay and started enticing sellers by offering less fee and better customer support along with multi channel retailing solution. To eBay or not to eBay? The question that has been haunting retailing minds in the recent years has finally been answered by its combatants in the zone. The retailing giant displayed hitherto e-marketplace dominance which is slowly being compromised due to its stringent seller policies topped with operational inflexibility and unsolicited burdens on sellers. Many eBay fanatics are now recoiling from the online selling avenue in pursuit of retailing happiness at other platforms. The ultimate competitors or preferred alternatives to eBay along with the reasons why they have an edge over eBay are explained below. TrueGether is a no fee marketplace adhering features and functionality similar to eBay and Amazon that makes it a better and cheaper alternative for selling products. TrueGether came into existence in 2012 and despite its newness into the marketplace world, this selling site has grown exceptionally within 5 years of existence. Just like eBay, TrueGether supports online transactions and international transactions. It has good site usability and is convenient to navigate around. The buyers and sellers' protection is guaranteed on TrueGether. Like other eCommerce website, TrueGether is integrated with Google shopping and Bing product ads. Unlike eBay, There is no additional cost for the seller on TrueGether. It is absolutely FREE to list items and sell. There is a special unique feature on TrueGether which is social media integration that does leverage social media platforms like Facebook or Linkedin to make such a marketplace which is not anonymous. TrueGether also offers an eCommerce solution where sellers take advantage of Multi-Channel Selling through platforms like eBay, Amazon, Google or Bing. Besides, being a successful marketplace, TrueGether is also aggressive in terms of product advertising to ensure the improvement in sales. Why to Choose Amazon as a Selling Alternative to eBay? Seller Supportive Platform: Sellers are given a free, basic account and also options to go for upgraded accounts with more selling features and privileges with free listing but a nominal commission on sales, whereas at eBay listing a product is charged, regardless of sales success and a commission is charged when a sale is made. Large Customer Base: In terms of market capitalization and revenue generation, Amazon is the largest ecommerce platform of the world. Amazon offers a conventional online departmental store where users can exercise the freedom to buy anything under the sun instantly at a lower fixed price. Large Seller Community: Amazon had already 2 million sellers in 2014 and they were successful in selling more than 2 billion products in the same year. As per a survey, almost 40% of the sells made on Amazon were from independent sellers in this year. Promotion-less Marketing: Amazon promotes products on behalf of its sellers. Standalone marketplace sites require sellers to spend lot of amount on promotion of products but the same is completely free when a seller chooses Amazon. Hassle Free Supply of Products: Amazon provides a great network for warehousing, logistics, dropshipping, delivery, customer service along with sales statistics and product performance status information with transparency in operations. Additional Facilities: Besides the profits earned from the sale of the products, sellers can get extraordinary facilities by selling on Amazon like free use of reporting, analytical tools and also contracted shipping rates. How is Amazon a Better Alternative to eBay? Amazon manages all the products in their warehouse while eBay is more like an auction house, where customers need to directly interact with the sellers. So Amazon is an easier marketplace for customers with a wide range of products at fixed price rates that reduces the overhead and increases the sales. While merchants need to pay a price for listing their products on eBay, it is absolutely free on Amazon. The additional perks like free and fast delivery of products makes Amazon more popular amongst buyers than eBay. This is one of the reasons that sellers get repeated customers at Amazon. Sellers are provided with unlimited image and media storage space at Amazon, which is unavailable at eBay. Who can sell on Amazon? Almost anyone from individual sellers to large-scale merchants can sell on Amazon. The product pricing should be competitive with good profit margins and that product and packaging quality, and customer service need to be beyond ordinary for high ratings and positive reviews, two aspects that would let you shine and survive as an Amazon seller. The history of Walmart in retail business goes back to 90s but it entered in the marketplace business in 2009 only. As of now, Walmart has not described itself as a proper marketplace but the company has already started inviting/accepting sellers to use the platform as an alternative to eBay for selling stuff online. Walmart is very selective in approving merchants to sell through their site. Walmart team first reviews the seller ratings, reputation, experience, and the last pricing strategy. Sellers have reported that traffic towards their personal store website has increased after joining the Walmart as one of their selling partners. Walmart does not charge any other fee or commission besides the referral fee which is decided as per the product categories ranging from 6% to 20% and on an average most of the categories are under the bar of 15%. Even though Walmart gives freedom to sellers to decide the price of their products, however, a seller reported that Walmart delisted his/her product based on the fact that the price was higher than its competitors. Merchants have already claimed that they are getting good sales from Walmart as compared to eBay. Unlike eBay, Walmart reports the sale on the day of shipping, not on the day of ordering the product. Who can sell on Walmart? Generally, if the seller is popular or has a good reputation on the current marketplace, Walmart may send an invite to that seller. The reason behind this move is to ensure that Walmart sellers do not face any unusual competition. In case if a seller feels that he/she has been missed, he/she is free to directly apply to become a seller on Walmart Marketplace. Walmart is the best suited to those sellers who are victims of the scams reported on eBay. Product listings are free while only a handful of job and automobile listings are chargeable on Craigslist. There is no commission on sales charged on Craigslist, while the shipping and delivery needs to be handled by sellers themselves which is a boon and a bane. Craigslist offers more flexibility in buying and selling since the bulkiest products can be sold here. Hiring professionals or experts locally like roof-makers or plumbers, is faster on Craigslist and less expensive as compared to eBay. The automated email services offered by Craigslist adds a security to sellers since their personal information does not have to be compromised. Ad posting or product/service listing is faster and free on Craigslist since it does not mandate registration or account creation whereas eBay requires registration for submitting posts which consumes a lot of time. The "FREE" section on Craigslist offers a quick selling opportunity for those who want to get rid of their old goods. Who can sell on Craigslist? Craigslist is best suited for hobbyists who want to sell heavy-duty products for decent margins sans the fees while having the freedom to sell and local sellers who want to personally manage their account and activities. Sellers can personally meet buyers and receive cash-in-hand rather than wait for automated back-end processing to receive their payment post commission. Bonanza is soon becoming the favorite marketplace for general merchandise listing ranging from quirky collectibles to rare fashion accessories at fixed prices or negotiable rates. Sellers can customize their price listing while promoting their products at lower commission rates by Bonanza as compared to eBay. Let us find out some of the crucial factors of Bonanza being preferred over eBay. Bonanza supports an easy-to-use virtual marketplace interface divided into several categories so it is easier for sellers to find the exact destination for posting their products. The platform is even more flexible which supports both price negotiation or fixed price. From household items to handicrafts, Bonanza is an economical selling platform for all kinds of goods. Small businesses keep more profits as the charges are less as compared to eBay. Bonanza ensures quicker selling of products as compared to eBay as it has cross platform integration with other sites like Shopify and WooCommerce to increase the conversions. Sellers are allowed to easily import or shift their products across the marketplaces like eBay and Amazon. Bonanza is a well-known marketplace in US along with its presence in 200 countries. Hence it is capable to generate same amount of business at lesser cost. Besides the huge seller base and millions of buyers, Bonanza is also effective to protect your products against scams and fraud buyers. It is linked with trusted payment gateways like Amazon Payments and PayPal which are reliable to both sellers and buyers. Sellers can feature products on Bing and Google SEs which helps in advertising through text links, banner Ads, and Bonanza Affiliate Programs. Bonanza is associated with Google AdWords and by paying a nominal fees, sellers are allowed to feature their products through Google advertisements. Who can sell on Bonanza? Bonanza is meant for sellers who want to sell unique products with lower overheads in a flexible marketplace. Small-scale to medium-scale sellers usually take advantage of Bonanza. New sellers who are less experienced and unsure of profits on eBay due to their stringent policies and high commission charges can opt for Bonanza. Sellers can take advantage of the Bonanza Affiliate Program to earn decent referral rates and utilize sales generating tools while promoting their products. This local arts and crafts community turned online niche-specific selling platform specializes in hand-made goods, craft supplies, and vintage merchandise. Etsy has been effective for mid or small scale sellers. Currently, The sellers on Etsy belong to furniture, handcraft, handmade and home decors. Let us see how selling on Etsy is more fruitful than eBay. Unlike eBay, Etsy is better suited to small-scale new sellers who want to sell crafts items directly to buyers at nominal rates such as $0.20USD listing fee per item and 3.5 % sale commission. eBay has the membership charges for selling while Etsy offers free membership, store operation and a four months free listing period until the product is sold. Etsy is more appropriate for selling such products which are at least 20 years old and thus it is an ideal platform for the buyers who are looking for boutique or handmade accessories as these are not produced in mass production process. eBay does not have such a unique stock of antiques or handicrafts as compared to Etsy. Sellers do get more profits on Etsy rather than selling on eBay because buyers know that they are getting individualistic items at Etsy hence do not hesitate to pay a bit more, while eBay customers are known to be more thrifty about the prices of the products. Unlike eBay, Transactions and operations are easier on Etsy while sellers get their personal shipping labels directly without technical knowledge requirement. Moreover Etsy has more personal flavor than eBay as it deals with a smaller community of people. Sellers do know their buyers personally and can get a honest feedback about their products. This kind of personal interaction also ensures that customized products can be made as per the demand of the buyer. Who can sell on Etsy? Sellers old and new who want longer product listing time and short turnover with lesser overheads may choose Etsy. They can do so directly with ready buyers rather than putting products on time-consuming auctions. eBid is the only competitor of eBay which supports selling through auctions. This auction site came into existence in the year 1999 and currently operates in more than 23 nations. eBid was awarded as the 7th best marketplaces besides eBay, by the merchants in a Sellers’ choice survey, held in 2018. Unlike eBay, The "Buddy Points" award program on eBid helps sellers earn bonus points through referrals or selling products that can be used to get discounts during auctions. Casual sellers who are attributed under occasional sales on eBid, are not charged any fee which is a big benefit to the small scale sellers who cannot afford eBay. eBay charges from registration, sales to transportation or shipment of goods; making eBid a better alternative to eBay. eBid has an impressive traffic of 15 million per annum. The site is also popular among Facebook users and gets almost 13,293 likes each day. So sellers must not fear about losing customers or buyers on eBid when choosing it as an alternative to eBay. eBid has no listing fees and the commission per sale is 3% while the rules are more relaxed than eBay, which means maintaining a store on eBid is hassle free. Unlike eBay, eBid has well-organized customer support which takes care of any unfair feedback provided by the buyer. Certain products like old coins, clothing apparels from some brands, stamps or ink cartridges have selling restrictions on eBay while on eBid it is easier to sell such items. Sellers who want more flexibility at lower overhead costs and lower risks usually go with eBid. Sellers who want to auction their products with better turnover can choose eBid which is best suited for small-scale to large-scale businesses alike. This online marketplace is meant for individual artisans and craftsmen worldwide who want to sell exquisite and rare handcrafted products, vintage goods and craft supplies. Here, the buyers and sellers can connect directly unlike eBay. Sellers can create their individual online shops and sell to art aficionados worldwide. Custom made and handcrafted products offering as per the choice of the buyers while not forcing them to choose from the available product list which is done by eBay. ArtFire promotes small-scale sellers through competitions where sellers globally can use the platform to improve their skills, become trend-setters, as well as feature their products through seller spotlight. Shops and product listings can be customized as per personal selling choices. Unlike eBay, sellers are allowed to customize their own shops at Artfire. Besides having their own logo they can create their own banners, can post pictures of their past works along with the ones which they are interested to sell. Who can sell on ArtFire? Any individual artist, craftsman, small art business, large art corporation, or artifacts and art suppliers can sell on ArtFire. All seller products are automatically shared on major search engines without the need for a website. Social media marketing is also done by ArtFire representing its sellers and their unique products. It provides sellers with the platform to connect with other artists around the world to introduce new products to their shops. They can also connect with their peers through communities to get best selling tips and product-related information. Multiple categories of products are covered on this platform. The brand image is so high that selling bulk SKUs might be a better idea on Rakuten. Product display flexibility, multiple options and listing liberty offered to sellers makes it a preferred platform for high-end products with customized catalogs. Offering follow-up campaigns to sellers, this site can help sellers do their own bit of market research before launching their products. Registration, fee structure, and commissions are simpler and acceptable by sellers. Rakuten offers cross-platform selling on BestBuy.com to improve sales. Selling plans are easier and the reward points option is the USP of this selling site. Rakuten provides product specification details which is very informative and it can lure the right buyers to the site. Who can sell on Rakuten? Rakuten is best suited for B2B and B2C requirements where large-scale and small-scale businesses can flourish due to the brand name and enjoy buyer trust and other benefits offered by the website. Sellers who want to expand their network through the site’s goodwill often do not mind spending for overheads, commission, and fees of Rakuten. eBay charges exorbitant prices whereas Gumtree does not charge any fees to individual sellers nor for shipment, payment gateways or other commission. Photo posting is free on Gumtree and up to 9 photos are allowed. Gumtree offers links to personal web pages and Ad promotions at a very nominal fee. Most transactions with buyers are direct without the need for processing fees. Gumtree has a very easy to use interface and the registration is quicker than eBay with less turn around time. Gumtree offers classifieds for both products and services like jobs, local repair, and rentals. Direct sellers of goods and services requiring faster responses from buyers with less overhead costs and no commission would be interested in Gumtree. Personal information may need to be shared, thus sellers who do not mind revealing their contact can take advantage of direct sales through Gumtree Classifieds. It offers a selling platform for customized gifts and creations with monograms from unknown/ small brands that are not usually spotted on eBay. The charges (commission and shipment) are economical for small-scale sellers who want to feature their products and gain popularity. Zazzle is known for its short delivery time. Delivery time is just 24 hours at Zazzle. Sellers do not have to store unsold products in warehouses or maintain an inventory which reduces the overhead costs they can produce made-to-order products on demand only. Who can sell on Zazzle? Zazzle is a fruitful option for small entrepreneurs, designers and small brand merchants who want to establish themselves slowly and steadily. Those who do not have a great network but want to set one up initially can choose Zazzle that does not charge a fortune but gets the work done much efficiently than eBay. Salehoo: A Site connecting Wholesalers and Retailers. Salehoo is a platform where sellers showcase their products with complete money assurance. This marketplace has delivered a platform to filter different types of products based on their expiration date. Also, Salehoo offers you buy the products at nearly wholesale price. This marketplace has even offered 24x7 assistance against any sort of issues. Why are Sellers Looking for eBay Alternatives? Multichannel retailing has not only become a matter of convenience but that of choice among the myriad options that we have today with respect to the selling platforms. Sellers are soon drifting away from the tight clutches of the eBay marketplace in search of better and more flexible E-retailing platforms like Etsy, TrueGether, eBid, Craigslist etc. Each platform has its own business model and functional structure which may significantly affect the sellers’ goals, financial interests, and selling potential while being preferred over eBay-the Online Retailing Giant. Every online marketplace charges a nominal amount for their services that constitute the post-sales commission, product listing charges, shipping and delivery charges, payment gateway charges, site maintenance charges, membership charges, warehousing etc. While selling on eBay, the sales-based commission rates may range from 12% to 15% and annual charges for other services can take a heavy toll on merchant accounts, not to mention the unethical hidden charges that may cause momentary shocks to sellers, especially if they do not have enough turnover. Some platforms like TrueGether charge only 2% post-sales commission while offering free unlimited products listing on their online portals. Sellers would definitely benefit from such services as they can affordably feature their product(s) to a larger buyer base. Sellers prefer an affordable site with better support for selling. The eBay marketplace has failed in providing both these essentials for selling. The alternatives to eBay have already sensed this opportunity and made sure that the seller gets full support either by call or text throughout the week without any additional cost. The interface on eBay is centrally controlled by eBay administrators and gives sellers lesser control over their own accounts and operations. Listing a product, the pricing, sales strategy, drop shipping, reviews, payment gateways, troubleshooting, negative feedback implications, buyer contact, warehousing, quality-control and many other aspects of selling online are controlled by the eBay management. It is thus necessary to maintain a good rapport with the eBay authorities and even compromise to a certain extent to their unrealistic terms and conditions in order to survive market volatility. Sellers benefit from better operational and functional control that they can exercise on alternative platforms to eBay. They can post as many or as fewer products as they like and reap the benefits. Even if there are disparities in sales turnover during off-seasons the alternate platforms do not charge a hefty fine for not creating a regular cash flow as practiced by eBay. Negative customer feedback does not impact seller account or lead to barring on other platforms and returns, direct customer contact/support, promotions, shipping and delivery rates, discounts etc. can be handled by sellers themselves with good process transparency. As per the recent report, Buyers are involved in more fraud activities as compared to sellers. The most frequent fraud activities done by buyers on eBay include use of illegitimate paypal accounts for making payment, claiming a refund without returning the purchased item, posting fake reviews and many more. The eBay support team works for protecting their buyers only so there is not much help provided to the sellers. Refund after purchase is a big pain for sellers as it results in a double loss. Loss of the product's revenue and the cost involved in packaging and shipping of the product. This certainly reduces the expected profit margin of sellers on eBay. eBay favors buyers so much that as a seller you can save your item from being refunded only by making it clear in your communication with customer that no refunds are accepted in any case. 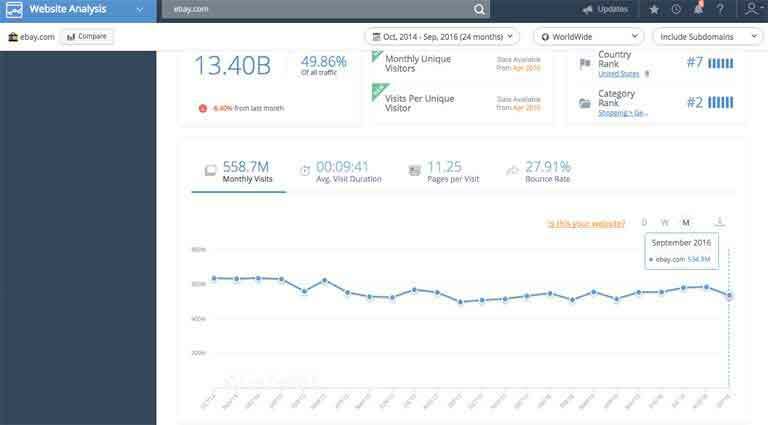 similarweb.com shows that eBay’s traffic has dropped steadily over the past few years, from over 600,000,000 worldwide visitors/month to around 534,000,000. That’s a massive drop - especially when you consider that services like Etsy, Shopify and Amazon Marketplace have all seen an uptick in traffic in the same time period. At the end of the day, the whole point of eBay is that it puts your product listings in front of as many people as possible. Sure - in the past, their platform was also valuable. But today, when it takes just minutes to set up a commission-free store front elsewhere, why bother with eBay if their user base is shrinking? There are numerous eBay alternative for sellers exists which have better user base than eBay. Ebay is highly affected by the scams and every time, sellers are bound to suffer because eBay favors their buyers. Recently many sellers have reported that they did not receive the payment of the product they sold. The worst part is, buyers reported that the product is not received by them. This is a planned scam and eBay has failed to provide a platform which is scam proof. This is why sellers are more into the alternatives to eBay. But when you factor in the fact that PayPal - previously owned by eBay - also charges you money for getting money transferred, you end up paying 10-15% commission in total. Bear in mind, this isn’t 10-15% on your profits - this is how much commission you pay on each sale. In other words, if you sell something for $1,000, you only get $900 of that money once you pay these two companies. If you’ve ever had problems ordering on eBay as a buyer, you probably know they stand up for their customers. They’re quick to give refunds, straighten out problems and make things right when you’re buying. Until it’s time for you to sell using eBay and you realize that as great as their customer policy is, their seller policy is just as bad. See, because eBay sides with buyers as a rule, it often doesn’t even bother to see if a seller may be right after all. And because they’re closely linked with PayPal, the latter can help them seize your funds without warning. While other alternatives to ebay like TrueGether are unbiased. Not what you want as an honest salesperson, right? eBay is Not Even That Profitable! On eBay, over 1/3 of sellers make under $10,000 a year. On Amazon, the respective figure is 9%. On eBay, only 30.4% of sellers make over $100,000 each year. On Amazon, the respective figure is - wait for it - 54.2%. Can you tell which company is more serious about creating a healthy, profitable environment for the people selling their products on it? This is not to say that eBay is awful or useless. Quite the contrary: it’s a wonderful place if you want to sell the odd bits and pieces lying around at home. It sure beats having to run a yard sale for your neighbors and having to sell everything at a fraction of its real price. Because of the above limitations, Many big sellers are moving to eBay alternatives which are cheaper and can generate better revenue for them. Recently, The Street pointed out many eBay scams came up at the time of transaction. One of the eBay scams is fake PayPal account of buyers to deceive sellers. Some buyers create fake PayPal account and send payment confirmation email to give an impression that they have paid for the items purchased. However Seller or merchant gets to know about this fraud post verification of the PayPal balance. Although this kind of scam may also happen on any other alternative to eBay but sellers complain that eBay doesn't take any action against such buyers. Other marketplaces have included the safety features for the sellers to avoid such terrible scams. Another discovery of EcommerceBytes tells that eBay support team doesn't discuss about the upcoming changes in the features of platform that are specific to sellers. It looks quite annoying as most of the sellers take time to get familiar of the modified feature which somehow impacts their sales. According to the public groups and community blog of eBay sellers, it is found that the fraud buyers makes a purchase of $250 or more and open a dispute with PayPal. The fake buyers claim that the item was not received. If the sellers have missed using signature confirmation for items $250 or more, The PayPal marks the items as not delivered and gives refund to the wrong buyers from the legitimated sellers account. The recent marketplace research also discovered that the interest of sellers in selling on eBay has dropped significantly after eBay increased PayPal and selling fee because the revised incremented fee structure directly impacts their profit margin. Besides a group of good sellers believes that all policies of eBay are designed in such a way that there is no space for sellers but the buyers, even the sellers are not safe in case buyer doesn't pay and eBay doesn't provide any assistance to sellers in case the transaction goes bad. Which Sellers on eBay are Switching to its Alternatives? Different segments of sellers exist on eBay and each one has its own reason of migrating from eBay to other similar sites. The first most seller segment is the one who is not happy with the revised fee structure of eBay and do not want to pay increased seller fees as it reduces their profit percentage. Secondly, The sellers who are disturbed with lot of refunds they receive from buyers on eBay as the policies are in favor of buyers. They claim that eBay doesn't want to loose buyers but the sellers. Third is the subset of sellers who has heard about fraud cases originally happened due to the fault of eBay support team. Last one is the sellers who are not happy with the customer service of eBay as they claim many of the seller related attributes are automatically modified without taking permission from them. So if you are the eBay seller and the victim of one of these cases, Look for better sites similar to eBay. How should you Choose a Perfect Alternative to eBay to Sell Online? Keeping the above alternatives in mind, irrespective of the type of seller, product categories or sales volume online, eBay that is a staple selling platform today can have the tables turned around for itself sooner. Any online seller would agree that experimenting on multiple platforms is the best way forward if one wants an upper hand in the current online selling scenario with an elevated sense of freedom and operational flexibility. Consider your target audience and the countries of business and choose a platform that gives a classified listing of products based on local demand. Ensure that listing your products is free (or at least done at a nominal rate) even if a moderate sales commission/ service charges are levied by the portal. TrueGether is one such eBay alternative platform that offers unlimited free product listings. Direct dealings between the seller and the buyer without middle-man intervention is imperative so that processes are transparent and responses are instant between the parties involved. More exposure to small-volume sellers should be given by the platform rather than to top-rated sellers alone. Sellers should have autonomous control over payment processes, shipping, and delivery. Ensure that they provide a decent support with shipping of products. These focal points emphasize on transacting effectively on eBay alternative sites that offer more transparency and flexibility to stakeholders today. Why should you Prefer TrueGether Over eBay? Currently over 10,000 sellers are using TrueGether as a primary marketplace and steadily growing their business to attain new heights of success. The best thing about TrueGether is that it doesn't charge any fees so that sellers are happy to offer some discount to buyers to make them happy. Here are the 10 good things about TrueGether which makes sellers happy. Free Listings: It's free to list on TrueGether. Yes, Always. Integration with search engines: Every item you post is sent directly to Google and Bing. Customer service: A very seller friendly Marketplace. Manage Multiple Marketplaces: Manage multiple Marketplaces like eBay, Amazon, Google Shopping. Receive your share of social revenue: TrueGether leverages the social presence of your business to boost revenues. Organise your customers: You can collect 'likes' and 'endorsements' from your customers to enhance your social presence. Online Reputation: TrueGether facilitates the management of the online reputation of your business. Global Marketplace: TrueGether lets you sell your products worldwide. Easy to use: It is very easy to join and add products on TrueGether. Compare features offered by different eBay alternatives and know how much cost is involved with it. Make the best choice to grow your business. It is recommended to go with multiple marketplaces and later on associate with the one which is the most suitable for your business in all aspects. I would like to thank the excellent customer service, excellent products, and easiness of the website. TrueGether is the best for buying whatever you need, and fast shipping. It's just a great place to shop! Prompt shipping, honest, very professional & ethical business TrueGether has been so far. I look forward to more business transactions and long lived relationship with TrueGether I'm still new but so far all has been phenomenally great. After being a member of TrueGether since few years I am delighted and satisfied. I browse TrueGether almost daily. It's a fun place to go look for things and research those oddities you find at yard sales! would always recommend it. TrueGether is a very handy and easy to use marketplace states a user. Especially the new updated site and its ease to use wallet is what the user loves the most. The free airdrops are straightly directed to user’s wallet. The site is so convenient that the owners should put in a 2F authentication in order to protect the account from being hacked. TrueGether makes it easy for users to integrate with their eBay store. Provides a platform which is great to sign up for receiving tons of new order. User would strongly recommend to sign up for a free account. Additionally the marketplace has helped the user to increase sales month after month. TrueGether offers excellent product range with attractive pricing. It truly justifies the name ‘TrueGether’. With such delightful experience have already recommended to many and would love to continue the same. TrueGether offers unbelievable great sales. The best part about it is that it syncs to the eBay account which makes sales effortless. Offers incredibly lower fees. Wish we’d learn earlier about TrueGether. Highly recommended to entire e-commerce community. Amazing platform to sell.I am selling on TrueGether since January. TrueGether continues to be the best place for me to sell my products online. I have met many great buyers. TrueGether makes sure you are happy as a seller. TrueGether lists all your listings without any cost. They help in finding the best way to sell products. I found this selling alternate with great eCommerce features along with handy Support team which is always helpful in solving issues. I have made plenty of sales so far. And they are not even charging for the listing. I always recommend TrueGether to other sellers. Most trusted selling marketplace. Their support team is always available whenever you need. I am a selling brand new items to fit your lifestyle and home. I love selling on truegether especially when someone new buys from me. They have a great experience from the start to finish and I really enjoy showing people the great side of selling. I found this selling alternate with great eCommerce features along with handy Support team which is always helpful in solving issues. I have made plenty of sales so far. And they are not even charging for the listing. I always recommend Truegether to other sellers. TrueGether is cheapest platform I have ever used for selling my toys. This platform is a big success for me. Thank you Truegether for providing this platform at the right time. TrueGether support team always gives suggestions to improve selling and all suggestions has proved to be easily manageable in the platform. They are more seller-centric unlike eBay. They gives me best selling experience. Unlike eBay, Truegether is totally secure, you always know your buyer. Transaction is very secure on TrueGether. Truegether team values their sellers alot. Earlier we used to sell our electronic products on eBay, but we were not fully satisfied with the results in the end. Every day we had some or other issue to discuss with the seller support team. On TrueGether from the first day itself things were pretty clear and no confusion was there. Even if we face any minor issue, the response is quick and precise. Yes we do have other sellers also in the category of clothing on TrueGether. The sellers communicate with each other on the forum where we have shared this biggest advantage of this platform. Every month we are adding more listings to our product catalog. Looking forward to righteous journey of growth with TrueGether. In eCommerce selling, Returns are the biggest headache for the sellers. We're also getting some share of returns, but the quantity and frequency is much less as compared to eBay. The credit goes to the product return terms and conditions laid by TrueGether. We have gained confidence in this platform with the time and would recommend it further to other sellers too. Being in toy industry, we had very less margin on products. TrueGether has given a good online exposure to our baby stuff and a chance to earn more. Seller policies are friendly. Process of making new listings is easy and non-complicated. I would say it’s better than ecommerce giants like eBay. In a span of just 3 months my product listings of women’s jackets are now fetching me regular income on this selling platform. Online shopping infrastructure gives equal chance to every seller to get noticed. We have also received several bulk orders. Thanks to TrueGether. We would recommend this platform to other sellers who are looking for higher sales and brand recognition. If you are looking for a website to sell your used goods in a safe manner, TrueGether is the place to be advised for. Terms and conditions right from shopping to return policies safeguard us from false buyers. Listings are made free of charge, hence at every point there is profit to earn and nothing to lose. Unlike Amazon or eBay, you get to know your buyer here much before any transaction takes place. It helps the sellers like us cater to our buyers in the most professional manner. I never felt bogged down under several different rules and regulations as a seller in this wonderful eCommerce platform. Received their help as and when required; TrueGether values its sellers so much! The transaction part is so transparent with TrueGether! Also it gives the seller an alternative payment option like Amazon. The best part is it never stands in your way of transaction! I never felt as a brand new seller while merchandising my products at TrueGether. It welcomes all its sellers alike; no matter whether you are a Brand or not! Really inspiring. Moving around this site, browsing around categories here at TrueGether is so easy and smooth. As a seller it has helped me a lot to often judge buying possibilities from a buyer’s perspectives. Anytime I faced any issues while enlisting my products, their support crew came out to help me as best as they can. The clear guidelines, easy and smooth accessibility to all makes so delightful here! I never felt bogged down under several different rules and regulations as a seller in this wonderful eCommerce platform. Received their help as and when required; TrueGether values its sellers so much. The transaction part is so transparent with TrueGether! Also it gives the seller an alternative payment option like Amazon. The best part is it never stands in your way of transaction. This low cost eCommerce platform has allowed me to sell products at a much lesser price compared to other renowned eCommerce stores. At such price, my products are real hit! I feel so glad about it! At TrueGether I feel really safe; about my identity and about my products! The dedicated security experts are so good in protecting our sensitive information. As a seller I feel really fulfilled on getting service-support from TrueGether any moment I ask for. It makes my selling experience here so amazing. Thank you TrueGether. Not just the buyers but sellers are taken care of as well. TrueGether helps us sell more and more, cares for all our details and makes our selling experience such a great and adorable one. Thank you guys! As i put my homemade wooden trinket organizer product up for sale at TrueGether; the result has been such delightful. This wonderful site keeps products across categories and makes selling such an experience! I sold a vintage AM/FM radio alarm clock model at the best price at TrueGether. The best eCommerce site for best Vintages’ when compared to some of its great competitors. Indeed!. I have listed endless products, multiple times at Truegether with absolute ease. Isn’t it wonderful that there is no transaction fee and I can keep large part of the transaction amount myself! Selling products here without having the eCommerce store interfering into any business dealings is something quite rare these days. Thanks TrueGether for not interfering at all and always maintaining transparency at its best. TrueGether is not just another website like eBay. These people are seriously making efforts to give their sellers and buyers best of selling and buying experiences. At each and every step their support team helps the new sellers like us. Being in clothing business we need to update listings every week. The process is extremely simple here. Response is also encouraging. For all new sellers, we recommend TrueGether as best selling site like eBay due to many similarities between these two platforms. The best part of this platform is, we as a seller get to earn good profits on every product sold, as there are no fees on product listings. We deal into both new and second-hand electronic items. For both the categories the customer base is pretty good. In order to expand our business it was required to sell on similar site besides eBay. Listing here was economically good decision on our part. Selling on TrueGether is convenient and policies also simple to understand and follow. Our business has gained better brand recognition after being listed here. Tired and sick of selling and experiencing losses on eBay, we decided to find eBay alternative. TrueGether was one of the 3 sites where we have listed our products online. The idea to shift our business to other portals worked well for our business. Amount of loss has decreased with growing sales. Recently the site has revamped themselves. Hence we decided to give TrueGether a try. With improved features and functionality, it was a great experience for us. The selling system is easier and faster to implement. Fees on listing products are zero. As of eBay being a market leader, finding exactly the same type of website seemed impossible to us. TrueGether has given us more than expected features and it's an an ideal ecommerce platform. Although the traffic is not massive like eBay, but units sold per month and average earnings is equivalent to eBay. Similar site like eBay in terms of features. We had a bad experience on eBay in terms of higher number of returns and fraud customers. But since we have listed here, we did not encounter a single fraud customer order so far. Also due to zero fees on product listings, no loss is there on product returns. TrueGether seems to be a better selling site as compare to eBay. There were several issues that were resolved here.For instance- no higher fees on product listings, lesser returns, better policies to safeguard the interests of the sellers, wide reach to international audiences and much more. For us TrueGether was a correct choice made for our business expansion. There are several websites that claim to be an alternative to eBay, but TrueGether can be taken as an alternative in true sense. Everything here is well-organized and in-sync. We have received several feedback from our customers, citing their online shopping experience from TrueGether a pleasant one. There have been repeated orders also from the same customers too. We found TrueGether as one of the easiest marketplaces to sell products. These people offer a lucrative platform to sell stuff besides eBay with no fees. This yields better margins and earnings at the end of the day! Although TrueGether’s monthly traffic is lower than eBay, the ratio of shoppers to sellers is much high. Hence less competition and more profit. We have got our brand products listed on multiple online platforms, including our own ecommerce website. Doing listings and selling things is quite easier on TrueGether. Also their reliable payment systems have been successful in gaining number of customers. TrueGether is online marketplace like eBay where we can sell almost anything. Major plus point that we have experienced here is, they do not charge for the listings. So we get a low-risk market hence it gives some room for experimenting. There is nothing to lose here. We got a trusted online marketplace where we can list a wide range of products. These people do not charge product fees, hence we get better environment to earn better than eBay. Their policies for promoting new sellers are appreciable. Finding exactly the same website like eBay seemed impossible to us. TrueGether has given us nearly all features and things we expected in an ideal ecommerce platform. Although the traffic is not massive like eBay, but units sold per month and average earnings is equivalent to eBay. My search for other place to sell besides eBay ended at TrueGether. The framework and functionality of the website same as eBay so I did not face any issue while handling. From the day one the things were smooth. Finally listed my items on TrueGether without paying any fee amount. We are paying major portion of our profits to eBay in form of the fees they charged on every product. So happy to be a part of this site. Rapidly Growing Alternative to eBay. Listing our products on TrueGether was right decision for increasing our reach to new subset of buyers. We deal in watches for both men and women. Numbers of orders are improving steadily. Shipping and return policies are friendly for both sellers and the buyers. With growing market of TrueGether our online market is also expanding. Seems to be the right decision so far. Being a platform similar to eBay, TrueGether also has a wide networks and large range of product categories. We essentially sell second hand items and this platform was fair enough to list our products. Initially the response was lukewarm, but after few months sales have gone up. For a site like eBay, it is essential to have all its best features within. We found almost all of eBay features exist on TrueGether. We sell antique and vintage goods and this online platform gave us exposure to a complete different segment of customers. Slowly but this platform is gaining popularity. No complain from the buyers so far. eBay Competitor with Domestic and International Support. eBay has become a over crowded marketplace from past few years. So we decided to switch on to TrueGether as an alternative to eBay. All good till now, getting some orders from it, No complain. We are in the process to increase the number of product listings on this site. TrueGether is a store like eBay with similar functionality in the website so no extra learning. Charges are next to nil. Although the website is still in its initial stages, yet the way I'm getting the response, business would surely grow on this platform. We were tired of other fake sellers on eBay giving buying from us and running auctions for the same products. Hence we wanted to list our products on another site like eBay but with genuine counterparts. TrueGether is one such online platform which has the highest potential of growth and treats it sellers very well. They have kept the fees very less and in some categories zero, giving us opportunity to earn more. Thank you! Great Selling Alternative to eBay. From sales point of view We're still in progression mode. We are selling garments for all age groups and were initially worried about the numbers. But due to lower fees on products the profit earned is better than eBay. So We'll recommend to use TrueGether as one of the best alternatives to eBay. Right Decision on Choosing an Alternative to eBay. Many ecommerce websites claimed to be a selling platform like eBay, but we found TrueGether as an exact match alternative to eBay. The overall selling experience here from past 6 months has been very positive. Even our offline business got a boost. Comparatively Better Place for Selling. eBay is the market leader and finding similar but cheaper marketplace took us months of research. At last we finalized TrueGether for listing our products. The overall fees on eBay is too much that leave very less margin for small scale sellers like us. Here on TrueGether, the fees is almost nil which adds more profit to every unit we sell online. Free Marketplace and well-Organized Website like eBay. All features and options at TrueGether are same as eBay, in short it is a website like eBay. So no training is needed to operate the things. Getting listed here was very easy and we got full support from the support team. We have also referred TrueGether to some of our knowns. Low Cost Marketplace with Domestic and International Support, Similar to eBay. Marketplace with Features Similar to eBay. TrueGether is a platform similar to eBay with more or less same features. The major difference between the two is, eBay charge very high fees on products and here on TrueGether all of the categories have no fees or very negligible amount. The support team here is very co-operative and professional. An Alternative to eBay with More Profit Margins. Visitors traffic on TrueGether may be little less than eBay, but by every means it is the best eBay alternative. Profits that we earn here is more than eBay as here fees has been kept extremely low. Number of orders per day is picking up slowly, which is a positive thing. Great Selling alternative and similar site like eBay. We have shifted our listings from eBay to TrueGether due to the high fees eBay charges on every product and separate fees for an e-shop. Such things are absent here. TrueGether is similar site like eBay hence easy to understand and within 2-3 days time we were on-board. So far everything is going fine. Low Cost Online Marketplace like eBay. Happy to work with TrueGether, an online marketplace like eBay. It is very much popular among sellers as well as the buyers. These people only allow genuine sellers to list their items online. So for us it was a great opportunity to be associated with TrueGether. Complete Ecommerce Solution and Cheaper Alternative to eBay. Vendors or sellers who are searching for an eBay alternative, should give TrueGether a try. We have done that, and believe us it was one of the best professional decision we took. Dealing in kidswear category the market on eBay was full of competition and we were nowhere to see. But here our products have better visibility hence better sales. TrueGether proved to be a good option as other place to sell like eBay. Weighing all its features and policies we found it an appropriate platform. The fees they charge on products is almost nil which is a major attractive feature of this website. From sales point of view, numbers of orders are steadily increasing. We were introduced to TrueGether which is fastest growing eBay alternative. During our course of online business here we discovered several advantages over eBay. It might differ according to the category you deal into. Our brand sells mobile accessories online and the sales in these 3 months have been decent. Number of returns is also lesser compared to eBay. Good Alternative to eBay for Increasing Profit Margin. We can sell our stuff besides eBay. Especially for retailers like us dealing in women wear, the charges levied by eBay was exorbitant. TrueGether charges almost nil in terms of fee. The profit has increased and it is better than eBay as of TrueGether is being cheaper. Number of orders per day has increased after using TrueGether. Brand recognition has also developed since I listed my products here. Overall better than eBay in terms of saving money. TrueGether is very much similar to eBay with best of promotions and offers they provided to the customers for better sales. We have always managed to sell good quantity of items through their website. One of the major reasons why many sellers like us are migrating from eBay because of the high final value fee they charge on every product’s sale. There is nothing much left to earn. TrueGether can be taken as an alternative to eBay as the entire set-up and functioning is same and most important the charges are very low. There are many online marketplace like eBay, but TrueGether is the cheapest we could find. These people charge negligible fees which is not seen anywhere. All other features are just like eBay, even the facilities. Although the business is little less here compared to eBay, but it’s growing. We gave it a try and happy with the results. We used TrueGether for selling our apparel items and till now it seems to be a better platform. Our business has been getting success since we started selling here. Number of returns is also next to nil compared to eBay. Due to seller friendly policies, fake buyers are much less on TrueGether. What more can we ask for! With so many ecommerce websites available it was difficult for us to choose the best site like eBay so that we have assurance of business and branding. TrueGether has been a recommended platform to sell products online. The payment terms are very clear and its regular. There are no hidden charges and the fee is also very low. The fees and charges on products at eBay are too high. At the end we earn negligible amount after all the hard work. We have garments business for men and women, the eBay charges are very high for this category. Here on TrueGether it is very low which allows us to earn good margins at every online sale. TrueGether is an alternative to eBay for the sellers who cannot afford eBay as the fees is much lower. Exposure to targeted customers is very good and we are receiving orders. Being a seller of home decoration items, we needed an online platform with best policies and visibility to international market. We are utilizing eBay for selling from past 5 years. The profits have been great but slowly due to increased fees and entry of more than required sellers per category makes it difficult to survive there. TrueGether is a site similar to eBay which is progressing steadily. Presently the market is not so huge as eBay, but they are expanding rapidly. TrueGether is a website like eBay with additional features along with low cost. Payment gateways are also reliable. Many of our eBay customers have moved to TrueGether as we can reduce the cost of items to some extent as of low fee here. Selling as well buying on TrueGether is a pleasure. We have selected this platform for selling our clothing items. The selling policies, sellers and buyers policies and return of product terms and conditions are extremely practical that does not cause sellers impacted in terms of money due to their very low fees compared to eBay. With so much stiff competition on eBay, finding site like eBay that provides the required exposure was difficult. One of my friend who is having electronics business and is existing seller on TrueGether recommended it to us. We deal in Kids wear and found shifting on TrueGether was the good decision we could take for our business expansion plans. The best thing that we liked about TrueGether was its seller-friendly policies, safeguarding the interests of the sellers and low fees on the products. Its an online store like eBay that provides the simplest way right from the process of orientation to listing products, processing orders and shipping them. Even the return policies are fair for both sellers and buyers. We had a good and profitable bags’ offline business and recently decided to also make it online. We wanted to list our products on other place to sell besides eBay due to various reasons. TrueGether was an instant hit with us, after a short discussion with the representatives, we were on-board. As of now we are getting orders from all over the country. We were extremely lucky to find TrueGether as a site like eBay which only lists authentic products and sellers on its website. We feel more secured and confident on TrueGether than on eBay. Slowly we are going to shift all our listings here as the sales increases. Happy to register as a seller on TrueGether. The entire site’s structure and system is easy to understand and put in-use. Adding as many as listings is free which is a big benefit over eBay. We sell handmade products and found TrueGether platform much useful in all aspects. Besides being economical, TrueGether offers excellent ease of use as it has the potential to be considered as better alternative to eBay. I would recommend to other sellers. I have been selling on TrueGether from past one year and it has been a wonderful experience as our brand has earned a decent revenue from the online business since registered on TrueGether. Being a small seller it is tough to get popularity on eBay. After searching for good online selling site like eBay, TrueGether was the final choice. We have shifted all our listings from eBay to TrueGether. Hope We'll create results as per our expectations. As a Seller, If you are tired of eBay charging different kind of fees and searching for some better alternative to eBay, We suggest TrueGether can be a better option as We are using this platform for selling our footwear items. The selling policies, sellers and buyers policies and return of product terms and conditions are extremely practical and transparent. Profit share on every product is higher due to their very low fees compared to eBay. TrueGether can be termed as market winner by putting forth interests of the sellers first. Their fees on every item sold is very less compared to the eBay. Love to use this platform for selling my stuff online. TrueGether can be considered as alternative to eBay as they charge very reasonable fees and traffic exposure is above average. In addition to that sellers are treated with patience and understanding when offering a resolution to an issue. As a retailer of consumer products, we have been getting good number of orders from different buyers. Found TrueGether as a selling platform better than eBay. The follow-through rates with buyers are almost nil. Initially I had tested TrueGether as a way to shift my listings from eBay and the response had been encouraging that helped me to decide the complete shift of all my listings from eBay. Despite the number of buying audience is smaller compared to eBay, We feel TrueGether is the most happening and promising site in terms of sales. This portal is similar to eBay where uploading items from some other market places is easier and quicker. I have got the option to sell without charges excluding the final value fee which is almost nil. Love to see that I can sell stuff besides eBay with no fees on TrueGether. The final value fee on each sale is very reasonable next to nil. Customer service is also better than other sites like eBaythat I had used. Much cooperative, Preferred over eBay to save money. TrueGether is better than eBay to sell stuff online in various aspects. The first and foremost being highly co-operative team who provides a great support and always work for improvements. Talking with them is easy as they are willing to listen to our problems. Five stars to the team and the website. I found TrueGether an ideal other place to sell besides eBay. The communication with the seller has been good so far. In terms of fees and charges, definitely much cheaper than eBay. Since we have started selling here, things have been fair and policies are transparent. If the quality is maintained, we would also continue with their services. We are satisfied with results on eBay and now wanted to expand so started to hunt for site like eBay. TrueGether is the perfect site for selling and buying purposes. The listings are live here from past few weeks and we have got more than 70 orders! It is good for music products. Visitors traffic is decent and we have seen increase with every passing day. For start-ups TrueGether offers perfect online launchpad! It is a selling site better than eBay for sellers like us who are starting small and have limited inventory. Things get noticed here and customer service for sellers is also very good. All our queries get solved instantly. Number of orders is fair enough to continue with this platform. Small but promising place like eBay to sell stuff. The apparel section of eBay has reached its saturation. And being in apparel industry we wanted to experiment with other places to sell besides eBay. After some research, TrueGether was selected along with few more online marketplaces. The market may be small at the time but it is growing. We are extremely content with the response we have received so far. Shopping website like eBay with the best policies for sellers. With TrueGether, We as sellers can have access to millions of customers. The policies for sellers are much better with responsive seller support service that can be reached 24/7. The return policies are also framed such that we do not have to bear significant loss which is a great thing. 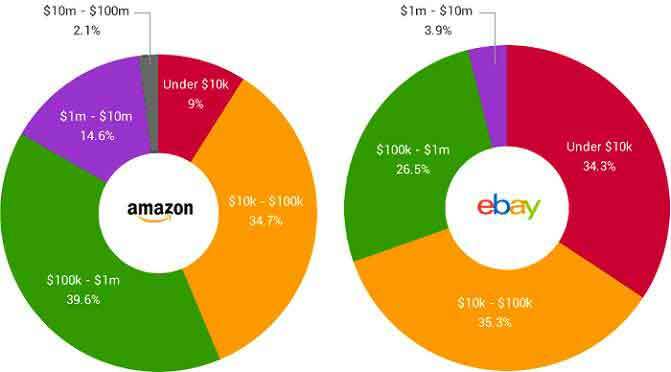 Internet eCommerce is fully dominated by eBay and Amazon. We as sellers need to list items on more than one website for better sales and brand recognition. We found TrueGether as more profit making platform as it has started generating sale from the day one. Will definitely recommend to other sellers as well. Site similar to eBay with added benefits. We have more profit margin here on TrueGether as compare to the eBay. Growth opportunities are much brighter as the market has limited sellers and wider exposure. The major plus point is free listings facility and lower commission of TrueGether on the products we sell. For new as well as established sellers, this is a great platform to showcase their products. Innovative Platform better than eBay. eBay has been a market leader of online marketplaces from past few decades but for us, the response has been lukewarm on eBay. So it was important to find other alternative site like eBay which has wider reach to the targeted customers with something innovative and new to offer. TrueGether is one such site, we have listed our electronic products on it. Getting responses with each passing day. I had been selling on eBay from last one year in menswear section. The response was good on eBay but were searching a platform similar to eBay to increase our profit margin. We're happy list our items on TrueGether. It’s been 3 months now and the response has been very positive. We have been into a business of antique items from past 20 years. As we wanted to expand through online marketplace, we searched for alternative to eBay. Reason being market and customer base for antique items did not have good response on eBay as shared to us by a reliable source. Since we have listed our products on TrueGether, people have started exploring us and orders are coming on regular basis. We only sell our merchandize through ecommerce websites. Our main focus is to list on all top-notch and upcoming sites with better business. TrueGether is online selling site as eBay. Some of its features as better than eBay and listing are completely free. Average number of orders per week is increasing gradually and hopes it gets better. We sell Men and women t-shirts online on eBay since 6 months but after deducting the taxes of eBay there was not much to earn. While searching for eBay alternative we found TrueGether. Overall system and policies of this website is seller-friendly, profitable for small business. Earning on per t-shirt is more here. Profits are steadily increasing by each day. Online marketplaces have become so competitive, we found it very hard to sell our products on eBay due to presence of several other sellers in the category of cosmetics. The focus was to find best eBay alternative where the user base may be limited but we get visibility. At TrueGether we got what we expected. eBay charges too much for listings and on items we sell through it. Hence we searched a lot for site like eBay that would be economical for start-ups like us. Charges are next to nil and profit earned is more than eBay. Since we listed our home furnishing items on TrueGether, we are removing our listings from eBay. eBay has been a market leader from years, but just selling on eBay was not sufficient for us to expand our profit making and customer base. We decided to list on TrueGether which is a store like eBay. Although the profit making is limited at present, but with every passing month it is increasing.